Each December 31st, we take the time to reflect on the year past and the days ahead. We make plans for our future, and hope for a safe and healthy year for our friends and family. But throughout many cultures, one’s luck in the coming year can be influenced by only one thing – food! In Spain, they believe that 12 grapes, one for each month ahead, will bring luck when eaten before the first and last chime of the clock at midnight. In Japan, they ring in the New Year with a bowl of soba noodles, with each noodle connecting the past to the future. We Italians have a New Year’s tradition of our own: lentils! 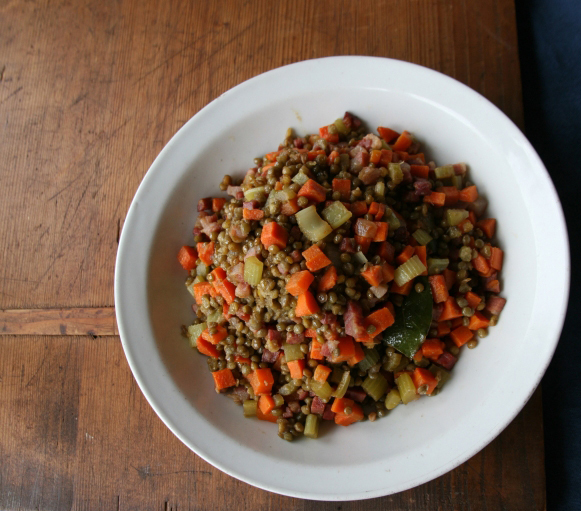 Believed to bring longevity and prosperity in the New Year, lentils pop up in all sorts of meals: soup, salad, or as a side to an Italian meat course like cotechino. This Country Salad is one of my favorite dishes for this tradition. Serve it hot or cold – either way, it will warm your spirit as you welcome in the New Year! In a large saucepan, combine the lentils, onion, carrots, celery, bay leaves and 2 quarts of water. Bring to a simmer and cook until the lentils are tender, about 30 to 40 minutes. Drain and remove the bay leaves. Scrape the lentils and vegetables in a serving bowl. Meanwhile, in a medium skillet, heat 2 tablespoons of the olive oil over medium heat. Add the pancetta and cook until crisp, about 4 minutes. Pour off most of the fat and add the remaining 2 tablespoons of fresh olive oil. Add the wine and vinegar and season the dressing with the salt. Bring to a quick boil, then pour the dressing over the lentils. Toss with the parsley and serve.